The Great Barrier Reef: one of the most amazing natural structures known to mankind. This area teems with life, both plant and animal. It provides adventures and relaxation to meet every whim. Throughout the 2,300 kilometres-long reef, you’ll find paradisiac spots that are perfect for relaxing or exploring the depths. One such place is Michaelmas Cay. This beautiful cay is home to a world-famous bird sanctuary, and home to many other animals. It also provides you with white, sandy beaches to relax on. When diving under the calm waters here, you’ll be introduced to an underwater world of colours. Hundreds of different species of fish and sea-life wander just below the surface. So what’s the best way to enjoy this fantastic area? Imagine having a day entirely personalized to your wants and needs. You can spend hours sailing on calm waters, and relaxing in the sun. You can find adventure under the water. And that perfect day wouldn’t be complete without a delicious, tropical meal. This is exactly what Passions of Paradise offers on their tour of Michaelmas Cay. On board their high-performance catamaran, you’ll enjoy a day of sailing, diving, and relaxing. Paradise Reef, an exclusive mooring just for this particular catamaran, is your destination for the day. You’ll be able to enjoy the wonders of Michaelmas Cay without having to worry about running into crowds. The highly attentive crew will provide everything you could possibly need. This includes free snorkelling tuition, a freshly-made lunch, nature presentations, and more! Whether you’re looking to explore Michaelmas Cay with your significant other, with your friends, on your own, or alongside your family, Passions of Paradise will sculpt the perfect day for your needs. A day in Michaelmas Cay must include adventure and underwater exploration. Take advantage of the top-of-the-line snorkelling and diving equipment provided for you. You’ll also have access to a dedicated naturist to help you understand what you see. And if the sun’s heat is too much, head inside to the air-conditioned saloon for afternoon tea. Once the day is done, Passions of Paradise will turn off the engines to allow for smooth sailing all the way home. 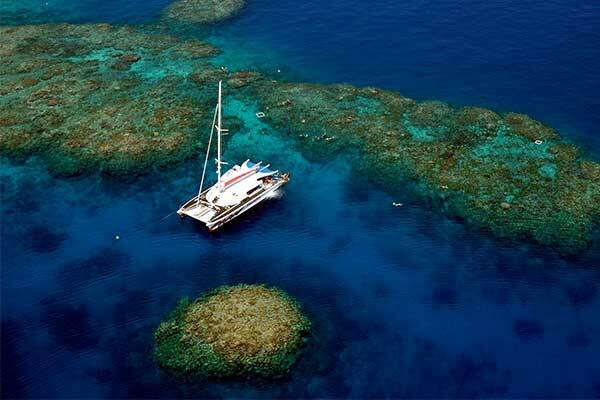 Take the reins yourself and get a taste of genuine sailing on the Great Barrier Reef. Explore nature and be pampered in relaxation on your perfect day with Passions of Paradise.